The marine park's soft white sand beaches are some of Australia's most beautiful. You can swim, surf, relax with a picnic basket, explore the coastline or just soak up the sun. For more tourism information, visit www.visitnsw.com. For information on beach safety in this area, visit www.beachsafe.org.au. Brunswick Heads, north of Byron Bay, is at the mouth of the Brunswick River. Its small, protected beach Torikina is great for children. 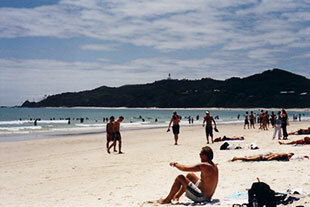 Byron Bay township is popular with beach goers, with open beaches for surfers of all levels. Seven Mile beach extends south to Lennox Head. Behind its dunes is Lake Ainsworth, its fresh water discoloured by tannins from ti (or tea) trees. It is popular with swimmers. Lennox Head's beaches attract more experienced surfers. Motorised vehicles (cars, trucks, motorcycles and 4WDs) are not allowed on marine park beaches unless permitted by Byron Shire Council or Ballina Shire Council, or are exempted from requiring a permit by these councils.